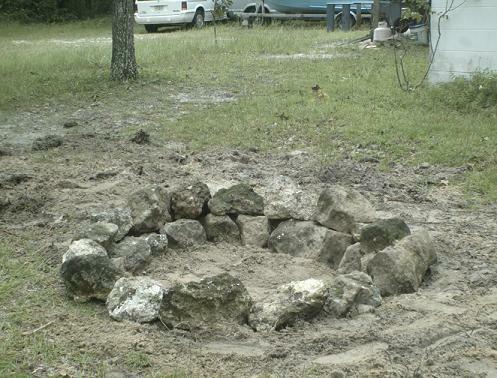 Here's the brand-new, no-frills fire pit I put in my back yard. I can hear them snickering at DIY Channel but, hey, it will do the job. Drop by and we'll toast some marshmallows. Or a whole pig...it's a big'n! 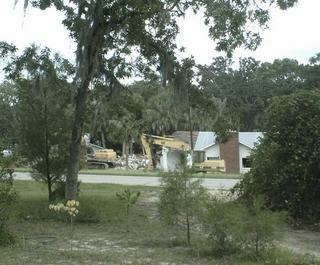 In the mean time, they've started the demolition of the motel across the street. A landmark and eye-sore in Steinhatchee since the 40s, to be replaced with a dozen condos. I guess I won't be able to go jump off the dock on hot summer days anymore. Here's a pic from my front yard.